How long till we kick these Republican states out of our country? I mean, it’s not like they want to be here, right? This summer has been a tough one for me. It began with my grandfather’s death. Shortly afterward, I learned that the husband of one of my best friends had killed himself — the reasons were mysterious, as they always are with suicide. 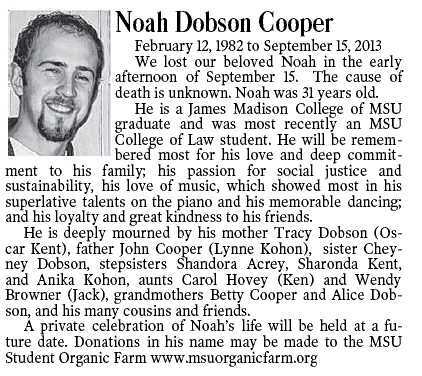 Lastly, just a few days ago, I learned that my earliest friends, Noah Cooper, was found dead in a park in my hometown. The cause of death is still unknown. Noah was my first friend. His parents knew mine and so we had play dates before from the very beginning of our lives. Once I was old enough to form memories, I always thought of Noah as one of the big kids since he was born almost two months before I was. It made me proud that someone of his advanced age would want to hang out with a youngster like me. Later on, we went to the same daycare at the old Bailey School, where we enjoyed climbing on the ceramic dolphin in the sandbox and using wood chips to dig up earthworms under the trees by the swing set. Sadly, all friendships give way to time — in our case, the coming of kindergarten. We went to different elementary schools, although we kept seeing each other at daycare. Around 2nd or 3rd grade, he stopped coming and, although we saw each other from time to time while growing up, we weren’t very close friends after that. I haven’t been in touch with Noah much in recent years. When I was on Facebook, we would exchange a message from time to time. In recent years, he has been finishing up law school and has been getting very involved with Native American rights in Michigan. He participated recently in a smudge ceremony to save a threatened sand dune from development. He wanted to go into tribal law. We’ve seen so little of each other in the past two decades, but I have definitely been thinking of Noah and his family (Tracy, John and Cheyney) in the last few days. A lot of childhood memories have been coming up. Noah was a great kid then, and it seems like he was a great man too. I haven’t seen him much in twenty years, but I feel — oddly — like I’m going to miss him. I’m honestly surprised how strongly I’m feeling the loss after all this time. It goes to show that sometimes someone makes an impression on you that’s so strong that, even though they aren’t in your life anymore, it’s comforting to know that they’re still there, still being the person you loved. Noah was the sort of person who could make that impression on a lot of people, and I’m sure there are all sorts of people like me, people who lost touch, who are feeling what I am now. There are people we are lucky to have had in our lives, and Noah was one. Thank you, Louis CK, for explaining exactly why I don’t like smartphones, except not really because this isn’t quite my issue with them. But good point.